Welcome to Enchanted Treehouses! Located on 52 serene, private acres, we are the newest treehouse resort in Eureka Springs, Arkansas! We are located at the end of a dead end street, so we have the back half of a mountaintop to ourselves! Our guests report seeing deer, wild turkey, and eagles. (Yet we are still only a mile & a half from the historic downtown.) We have spaced our treehouses out to provide privacy for our guests. We opened our first two treehouses at Christmas in 2015. Our third treehouse was completed September 2016. We are just getting started on two new treehouses (Lil' Red & Rapunzel)! We hope to add 4-5 more eventually over the next few years. These are beautiful, luxury, adults only treehouses with tons of character and detail. Pictures don’t do them justice…..and the setting is so peaceful. Explore our website for more information & come for an unforgettable getaway! Check-in is from 3:00 p.m. to 5:00 p.m. daily. If you plan to arrive after 5:00 p.m., please call the office in advance at 479-244-6231 to make after hour arrangements. If we are able to have your treehouse ready for early check-in, we will gladly call you, but we can't guarantee an early check-in. The treehouse rentals work similarly to a vacation condo or cabin rental. Each comes fully furnished with a kitchenette with dishes and cookware, etc. Home away from home basically. We ask that you leave the treehouses in the condition you found them in. We will change the linens and sanitize between guests. You wash your own dishes, etc. At Enchanted Treehouses, it is our mission to create a relaxing, peaceful environment where our guests can come to recharge, reconnect, and have fun. We all have an inner child. We hope you find yours during your stay. We will do our best to make your stay enjoyable and memorable. All treehouses come with romantic fireplaces, jacuzzis for two, a separate bathroom with shower, kitchenettes stocked with dishes and cookware, gas grills on the deck, cable TV, free wi-fi, beautiful king-size beds, quality linens, and are located in a beautiful, serene location in Eureka Springs, Arkansas. It feels as if you are in the country, away from everything, but you are only 2-3 minutes away from restaurants and activities. The treehouses are conveniently located on Dogwood Ridge, 2 tenths of a mile west of the Rowdy Beaver restaurant that is located on W. Van Buren. Dogwood Ridge is a dead end street and we are located at the end of the street. Some GPS systems will try to have you turn at one of our neighbors' homes. Just come all the way to the end and you will see the little, blue office building. There's a trolley stop within easy walking distance (less than 5 minutes). Note: There are no telephones in the treehouses, but cell phone reception is excellent. 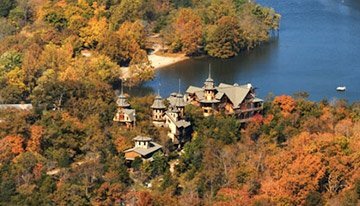 Enchanted Treehouses offer hassle-free vacation rentals in beautiful Eureka Springs, Arkansas. Each of the treehouses available is built along a ridge top and offers beautiful views of the surrounding forest and/or mountains. Perfect for couples celebrating an anniversary or needing an escape from everyday life, our themed treehouses have all the amenities you desire. "We have stayed at many treehouses over the years, and this one is the BEST!! The views are amazing and the bed linens are to die for!! Loved the fresh flowers.....Thank you for building such a beautiful getaway---we will definitely be back!" Eureka Springs is surrounded by water….three lakes and two rivers…Beaver Lake, Table Rock Lake, Lake Leatherwood, White River, and King’s River. There are numerous water activities available. There is fishing, swimming, hiking, canoeing, kayaking, and boating (you can rent boats and pontoons at Starky Marina on Beaver Lake or Big M Marina on Table Rock Lake). Eureka Springs is known for its historic Victorian architecture. Check out the Historic Loop and Historic Downtown with its many shops, restaurants, and art galleries. Eureka Springs is repeatedly named in the Top 25 Art destinations to visit. 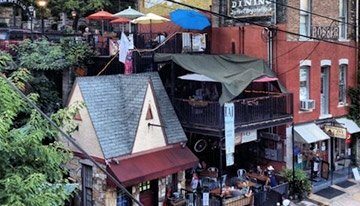 Eureka Springs is a small town nestled in the Ozark Mountains. 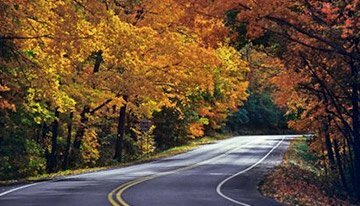 The winding roads leading into the town are filled with curves and beautiful views, especially in the fall with the changing colors of the trees. Motorcycle enthusiasts come from all over to drive "the Pig Trail".